The overwhelming size of the venue was enough to get visitors excited, with its rumbling of machines in the live demo areas and on the stands a sure sign IFAT would fulfil its promise of offering the very latest in technological innovation. IFAT also offered the space for industry to come together to discuss best practice and key topics of debate, most crucially the filtering of microplastics, more effective plastics recycling and the industry’s digital transformation. All weighty topics that have attracted much public attention, which served as a reminder of the rising demands of the industry’s services and products across the globe. 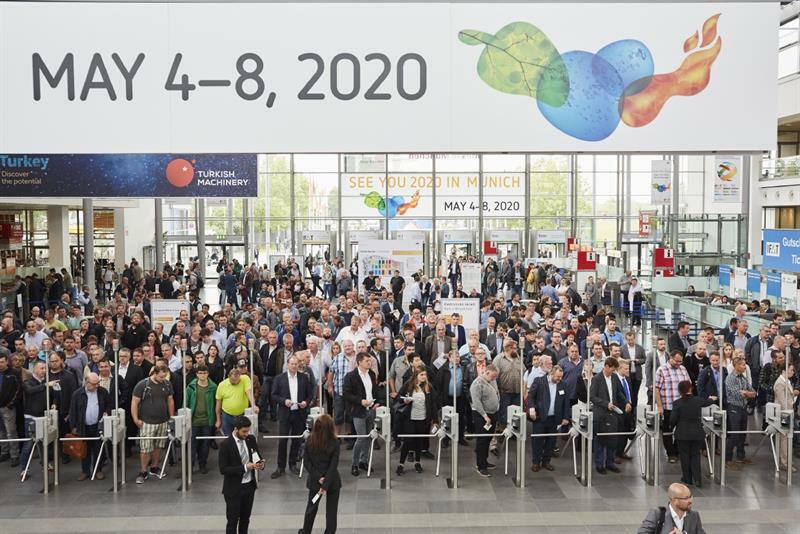 Stefan Rummel, managing director of Messe Munich, the events company behind IFAT, said: “IFAT presents the technologies of the future for clean environment, hence it is driving the public discourse more actively than ever before. The UK may be planning its exit from the European Union in March 2019, yet keeping positive trade ties and relationships will be essential. Naturally, due to the show’s location, there was a focus in its seminar programme on European policy, particularly the European Parliament’s Circular Economy Package, which was formally approved last month. The seminar was lively and well-attended, an assuring sign of the industry’s willingness to keep up to date with the latest legislation. Andreas Jaron, head of international matters of circular economy at the Federal Ministry for the Environment, Nature Conservation and Nuclear Safety, made big promises about the package. Although the package is large in its potential, Jaron raised concerns about its targets. He added: “By 2030, there’s a 60% recycling target based on municipal solid waste but not even five member states [of the EU] will be able to achieve the current target of 50%. There may well be uncertainty over the UK’s targets in a post-Brexit landscape, but some businesses believed the transition has been nothing but good news. Peter Jones, UK branch manager of WEEE recycler Eldan Recycling, said: “Brexit hasn’t had a bad effect on us so far, and I don’t think it will. People are still looking to buy something of quality, and as we’ve always been a big name in the market, we’re not worried. There was much talk of market drivers in both seminars and on the stands, with companies predicting what obstacles they will be facing over the next few years. Obvious issues included: China’s National Sword programme, technological development and new legislation. Harriet Parke, Eunomia senior consultant and member of the RDF Industry Group, gave an update on the refuse-derived fuel (RDF) import market, revealing that RDF exported from the UK has been plateauing since 2016. She also pointed out that the RDF market had consolidated over the past few years, with smaller players falling away while Biffa and SUEZ battle to export the most RDF. Parke spoke of great uncertainty post-Brexit given there were many unanswered questions with regards to tariff barriers and exchange rates. Top of the list of market drivers for TOMRA Sorting Recycling ­was plastic pollution, where it was revealed 32% of plastic produced goes into seas and 40% gets landfilled. In 2017, TOMRA signed up to the Ellen MacArthur Foundation’s New Plastics Economy, which encourages the transition towards a global plastics system guided by the principles of the circular economy. The company used IFAT to demonstrate its Laser Object Detection system, which is capable of detecting material that near infrared technology cannot. This allows companies to reach high purity levels, something of great importance following China’s import restrictions. As mentioned countless times in the column inches of RWW, technology really is the driving force behind the industry. Most companies use IFAT as a launchpad for their new products and updates. There were numerous upgrades to shredders, balers, sorters and compactors, all promising customers they really are worth their weight in waste. Throwing its hat into the ring was equipment and services provider METSO, which has launched a new software tracking solution allowing owners to see updates to its machinery. GPS updates from the software now allow both customers and METSO to understand the equipment more clearly: when it will need a service, what went wrong and, most importantly, how to prevent product damage before it occurs. Laila Søndergaard, METSO marketing manager, said: “Data management will grow in every business – the future of waste management is data. The more we know about the product, the better it will be for us and our customer. "All of this new technology is helping us to connect closer to the customer.” Although she admits the technology isn’t the first of its kind, it demonstrates a growing trend of tracking solutions being made available throughout the waste sector. Walking around the outdoor space, it became apparent that more and more companies are offering an electric alternative to diesel- and petrol-guzzling vehicles. From collection trucks to street cleaners, most major companies now seem to be giving brands the chance to go practically emission-free, which is all the more important given Defra’s plans to reduce air pollution in major cities. Silvia Knorr, segment marketing manager at Aebi Schmidt, said: “Electric vehicles are getting more popular, especially in bigger cities. I don’t think diesel will die but we do have to find the right balance. The waste management industry is moving fast, and with increasing public consciousness of environmental issues such as ocean pollution and air quality, there has never been a greater need for exhibitions such as IFAT to demonstrate that the industry is more than capable of keeping up.